The 1930s saw a lot of brilliant advances in modern technology: the invention of Scotch Tape and Polaroid photography, the first versions of jet engines and successful helicopters, and of course, the very first canned beer. When it came to home kitchens, however, Liv and her husband, David, discovered the 1930s may as well have been the Dark Ages. “We knew we would need to renovate as soon as we saw the kitchen,” says Liv. “It was original to the house, which was built in 1938, and it only had two drawers!” Luckily, Liv and David had planned their budget accordingly. When it came time to bring her kitchen into the modern day, Liv knew she wanted an IKEA kitchen for a few reasons. Versatility. Liv and her family needed a space where everyone could work together (and not just for cooking), from the youngest child to mom and dad. Liv had played around with IKEA’s home planner while still in their previous home, and her take probably won’t surprise you. 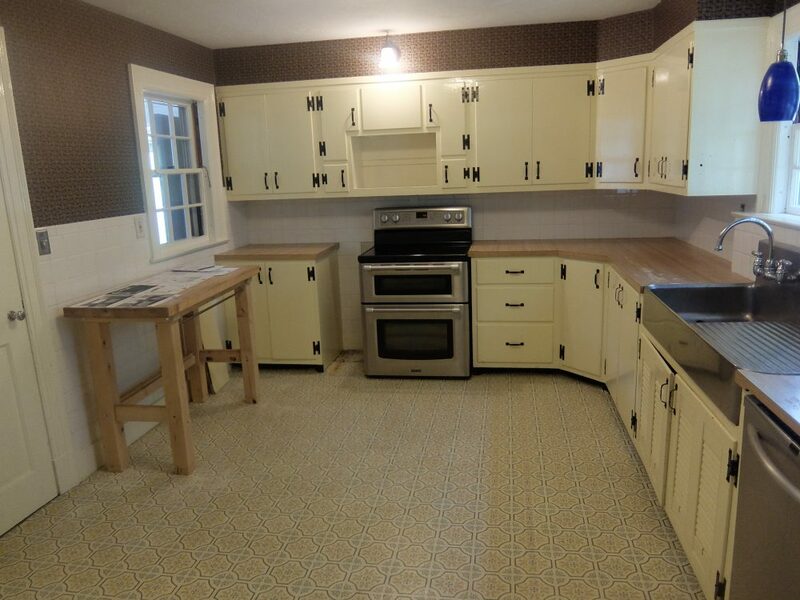 Bringing this 1930s kitchen into the 21st century came with its own set of challenges. Ceiling height. Liv’s home didn’t have a uniform ceiling height, which meant getting creative with cabinets. See how they utilize more space above the refrigerator now? Yikes! Look at all the holes in that concrete. Between the expertise of IKD’s design team and Liv’s willingness to go with the flow, solving the design challenges for this 1930s kitchen was a snap. Liv has a few words of advice for anyone out there dreaming of their new IKEA kitchen. Her friends and extended family agree. “It’s a showpiece. Everyone who comes in is wowed by it.” We know that we are, too! Liv, we hope you and your family enjoy many happy years learning, laughing, cooking, and crafting in your new kitchen.